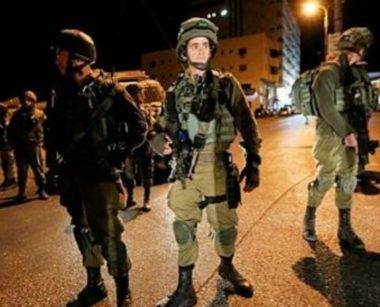 Israeli forces, at dawn on Friday, detained a Palestinian teen with a third of his skull removed, as a result of Israeli gunfire, from Nabi Saleh village, in the northwest of Ramallah. Muhammad Tamimi, a member of Nabl Saleh’s Anti-Settlement and Wall Committee, told WAFA that Israeli forces assaulted and detained Muhammad Fadel Tamimi, after ransacking his family’s home. The 16-year-old teen had a third of his skull removed in a surgery, after being shot and seriously injured in the head with a rubber-coated steel bullet, at close range, by Israeli forces in December of 2017. Tamimi added that soldiers assaulted a man with pepper-spray, requiring him to be rushed to a hospital for medical treatment. He reported that medics confirmed the man underwent a catheterization, in the aftermath of the assault.